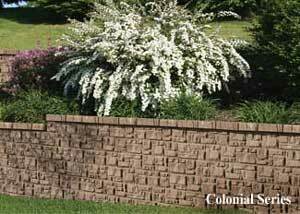 Introducing the first Eco-Friendly mortarless concrete retaining wall system - AB Fieldstone Collection®. This innovative new product has unlimited possibilities in style and constructability.It is right at home in residential settings or up for any task on commercial projects. 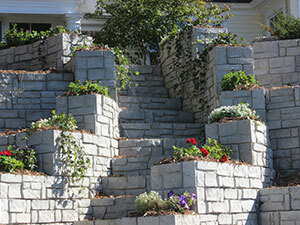 AB Fieldstone is an innovative new concept in the manufacture and use of segmental retaining wall (SRW) systems. By manufacturing this system in 2 pieces - the facing unit and the anchoring unit, Allan Block has opened the door to many benefits that are not only Green, but Natural and Friendly as well. The ability to build taller gravity walls with the same installation practices as our AB Collection and AB Europa Collection, there is no new installation process to learn. Free standing two-sided walls or parapets are easy to integrate into a project or built to stansalone on an extisting structure. 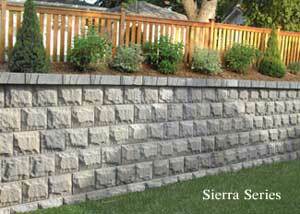 By placing the facing units back to back with the AB Dogbone unit, a parapet can be built to any width. Learn more about parapet installation. 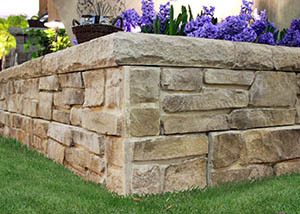 AB Fieldstones come in two pieces – a natural stone face and a universal back which anchors the blocks in place. The facing units are created with differing looks, styles and colors, which are called Series. SAU - short anchoring unit 6° 0.7 sq ft. approx. LAU - long anchoring unit 6° 0.7 sq ft. approx. 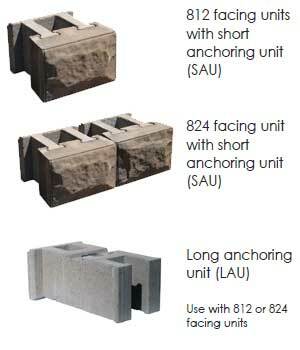 SAU - short anchoring unit 6° 1.3 sq ft. approx. LAU - long anchoring unit 6° 1.3 sq ft. approx. Color & Series Availability is determined in each local area. Contact your local retailer for a list of available colors in your area. 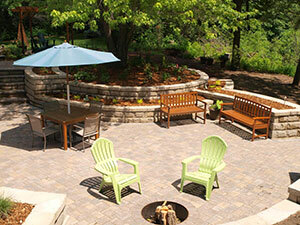 AB Fieldstone is currently manfuactured by a select number of Allan Block manufacturers. 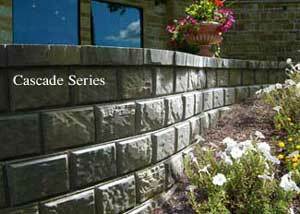 If AB Fieldstone is not currently being produced in your area, work with your local manufacturer to have it shipped in.